A new suit of armour, a new creative team, and a new direction for the suave genius Tony Stark. Details below. The Future of IRON MAN Is Marvel NOW! Superstars Kieron Gillen And Greg Land Take The Reins Of Marvel’s Armored Avenger! This November, Tony Stark soars to new heights in Iron Man #1, kicking off the all-new ongoing series from the chart topping creative team of writer Kieron Gillen and artist Greg Land! As part of Marvel NOW!, Iron Man joins a line of titles that will take the Marvel Universe in an exciting all-new direction, as the industry’s top creators join the top Super Heroes to deliver all-new ongoing series, great for new and lapsed readers alike! Technical visionary. Unparalleled engineer. Avenger. Iron Man has done it all, from combating the greatest threats facing the Marvel Universe to dealing with his own inner demons. Now, when his greatest invention becomes his greatest mistake, Iron Man must act fact…and build faster! The lethal techno virus Extremis is out in the wild and for grabs to the highest bidder! It’s up to Tony Stark to contain it and that means creating a new suit of armor! Marvel NOW! is the culmination of Marvel ReEvolution, the groundbreaking new initiative to evolve the comic book experience through innovation. With Iron Man, Marvel NOW! ensures fans will see a side of Tony Stark, never seen before. The story will focus on him questioning things about himself and trying to find out exactly how the universe ticks, what’s this all about and why he does this anyway,” explained Kieron Gillen in an interview with Marvel.com. “There will be a lot of changes in the armor throughout the series; in the first five issues there will be a different armor every issue. 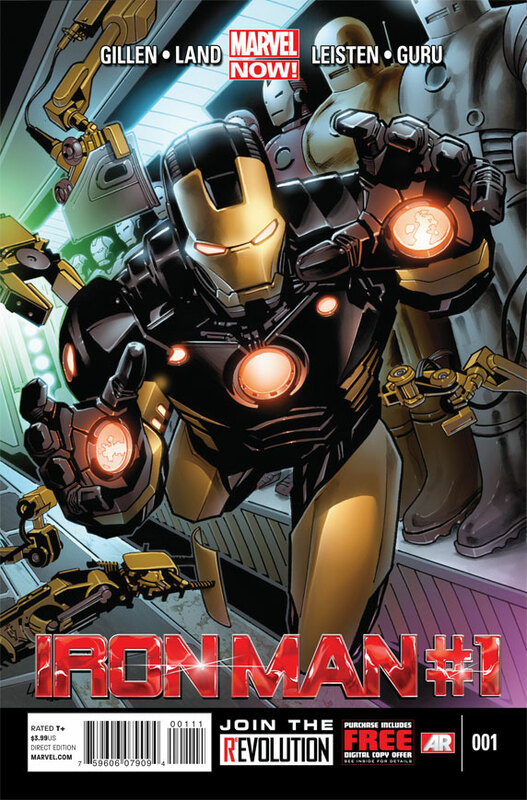 Each issue of Iron Man includes a code for a free digital copy on the Marvel Comics app for iOS and Android devices. Additionally, each issue of Iron Man features special augmented reality content available exclusive through the Marvel AR app – including cover recaps, behind the scenes features and more that add value to your reading experience at no additional cost. An all-new direction! All-new threats! All-new armor! This is Iron Man NOW! This November, Kieron Gillen and Greg Land redefine what it means to be invincible in Iron Man #1! For more on Marvel NOW!, please visit now.marvel.com and join the conversation on Twitter using #MarvelNOW.